Camille comes with beautiful listing, mansory and grid layout, a minimal and elegent way to make your blog stand out of crow. 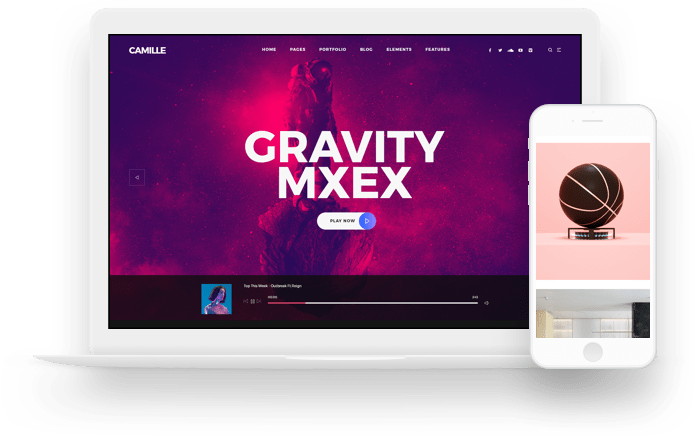 Camille is fully responsive, adapt the device size, pixel perfect and all elements look beautiful in all standard and retina devices and resolutions. Each Camille demo is equipped with an accompanying set of beautiful, practical, and creative inner pages. Camille future proofs your design with the integration of the widely used and best selling below plugins. Camille is support RTL. You can easily translatable in to any language with RTL directions. Each demo built with Camille will look different. Without any coding knowledge you can create amazing websites. With Camille, you will get lifetime free updates. Updates may contain various theme improvements, bug fixes and security updates. Camille is fully WPML compatible and also contains .po and .mo files that can be used to easily translate the theme without much hassle. From loading animations to toggles, and modal windows to smooth scrolling navigation, Camille offers your visitors a clean experience.